Want to be charitable & receive discounts on prints at the same time? Want discounts on prints? Try the CatPrint Cares Charitable Donation Discount Program! 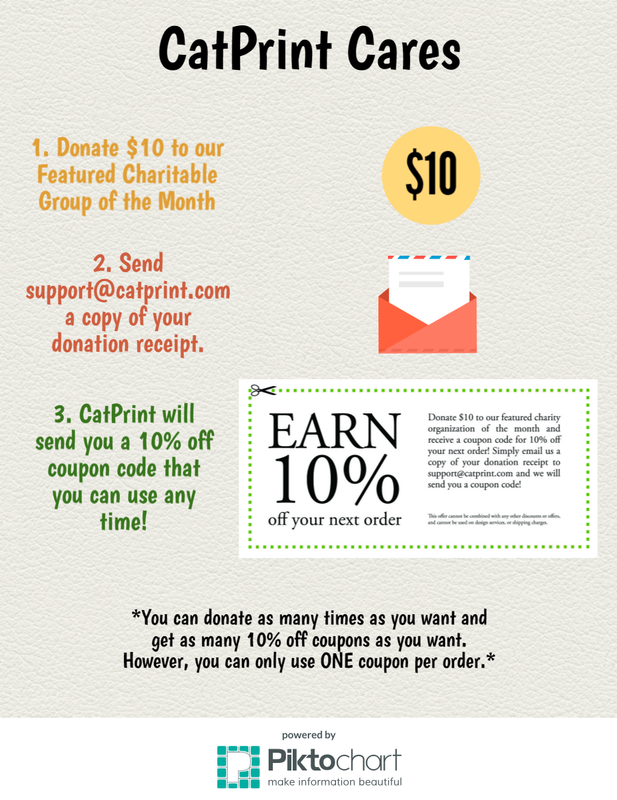 In 2014, CatPrint started a charitable donation and discount program called CatPrint Cares. CatPrint Cares is our way of showing that we care about nonprofits and charitable organizations. When we first launched the CatPrint Cares Program, our main focus was on nonprofit animal rescue groups. Thanks to all of our animal loving customers, we were able to make CatPrint Cares a very successful program. We were able to raise hundreds of dollars for local animal shelters and rescue groups in Rochester, New York thanks to individuals like you. How does CatPrint Cares work? CatPrint Cares is a simple discount program. Each month, CatPrint has a featured local organization which you can find in the monthly newsletter or at www.catprint.com/pages/catprint-cares. When you donate to that featured local organization during that month, and email CatPrint your donation receipt, you will receive a 10% off coupon. What are some previous organizations that have been a part of the CatPrint Cares Program?